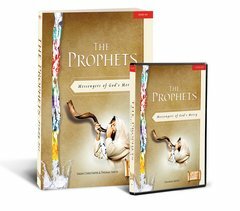 The Prophets: Messengers of God's Mercy Starter Pack by Thomas Smith and Sarah Christmyer The Prophets Starter Pack includes the 5-DVD Set (ten, 30-min. sessions in which Thomas Smith provides expert commentary on the biblical prophets) and the Study Set. A Study Set is essential for each participant. It includes engaging study questions (with lesson summaries, home reading assignments, talk outlines, charts, diagrams, and more) and a set of suggested "Responses," which are needed for home preparation, small group discussion, and lesson reviews. •Study Questions (with lesson summaries, home reading assignments, talk outlines, charts, diagrams, and more) •Suggested Responses (for lesson review) •Study Binder •5-DVD Set (ten, 30-min. sessions) ) Jeff Cavins is recognized both nationally and internationally as one of the most effective and engaging speakers In the Church today. Few can communicate their love for Jesus Christ with as much zeal, clarity, and enthusiasm as Jeff Cavins. In addition to his outstanding presentations related to Catholic Bible study, Jeff is available to speak on a variety of other faith-formation topics. After twelve years as a Protestant pastor, Jeff returned to the Catholic Church under the guidance of Bishop Paul Dudley. His conversion story, one of the best known and inspiring stories of its kind, is chronicled in the best-selling book, My Life on the Rock.